LOL piper.... . Wallpaper and background images in the Helden des Olymp club tagged: photo. Harry Potter and Percy Jackson are best friends?! Camp Half-blood oder Camp Jupiter?? Who's that Pokemon? It's... PERCY JACKSON! Jason and Reyna - I Liebe drawing them! oh my god i am crying!!!!!!!!!!! Wow, these characters look familiar! OH MY GOD ITS DEFFINETLY OFFICAIL NOW. And what's Wrong with England? 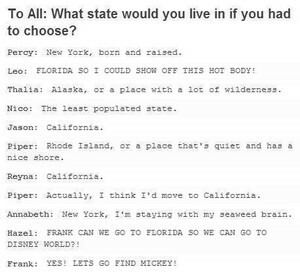 Nico and Thalia confirmed for Alaska. 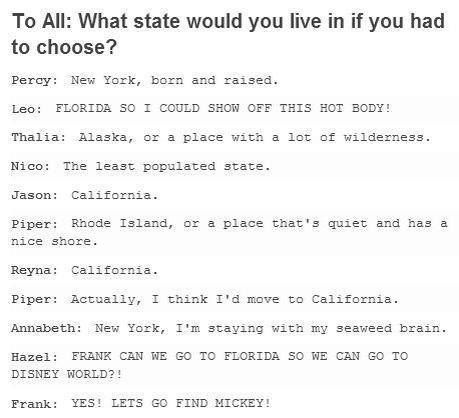 Leo, I'd definitely move to Florida with you. Frazel is so cute! Piper is like awh heck no Reyna u aint getting with my bf. He dont like you so get over it. HOUSE OF HADES TRAILER! Amazing! What if Percy went in the robot instead of Bianca? Let's see!